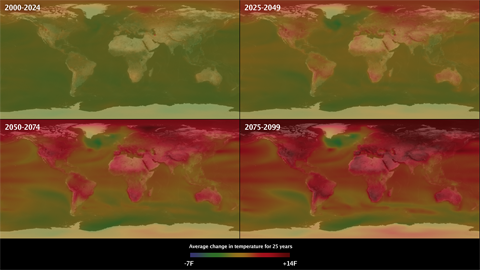 AVL artist-technologist Alex Betts worked with atmospheric scientists Don Wuebbles of University of Illinois and Katharine Hayhoe of Texas Tech University to visualize predictions of temperature change that will occur if human societies do not cut back on greenhouse gas emissions. These dramatic visualizations were presented by Dr. Wuebbles at Planet U, a national conference on the "human story of climate change" that was held at the Beckman Institute April 8-12 in 2009. The stills below represent movies that show change over time, with the last depicting a projected 100 year span.